Saving up enough to buy your first home is exciting for a number of reasons, not least of which is the fact that you no longer have to cut a rent check to someone else for a place that isn't yours. Oftentimes, purchasing is also the cheaper option in the long run. But what if continuing to rent is actually the more fiscally sound choice in the area where you live? If you've been wondering if that's the case where you are, a new map could make it a little easy to figure out by revealing whether it's cheaper to rent or own in every state. The new visualization from the team at HowMuch was created using housing data collected in March 2018 by Zillow and GoBanking Rates, and labels each state depending on whether it's cheaper to rent or buy there. 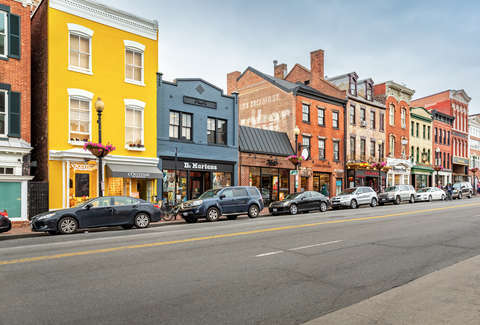 There are also a few states that they classified as neutral, simply because the average difference in cost between renting versus buying there was less than $50 a month. 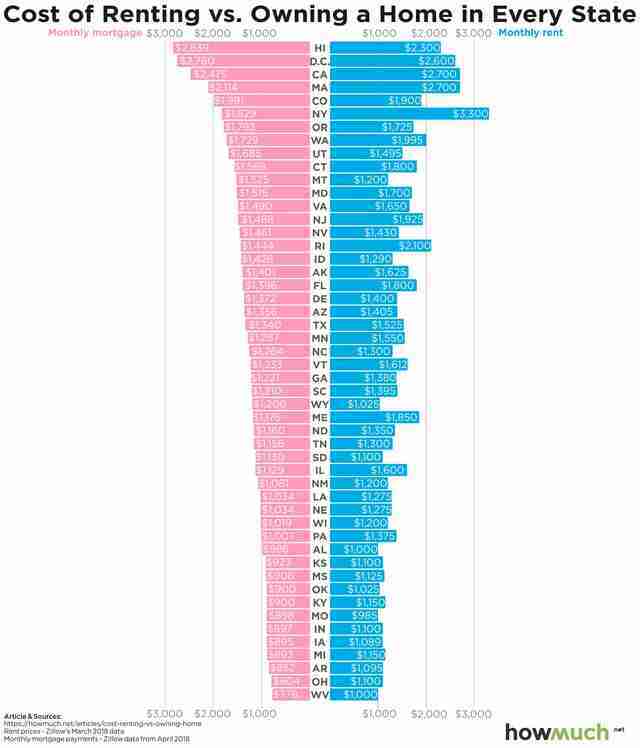 By and large, you'll notice it's cheaper to buy a place in America, with renting being more expensive -- on average -- in a whopping 40 states. However, there are a handful of places where the numbers suggest that renting is the better way to go. The states where it's cheaper to rent in 2018 are Oregon, Idaho, Montana, Wyoming, Colorado, Utah, Hawaii, and New Hampshire, as well as Washington, DC. It's a little less clear what the best option is in Nevada, Arizona, South Dakota, Alabama, North Carolina, and Delaware, which are all classified as "neutral." 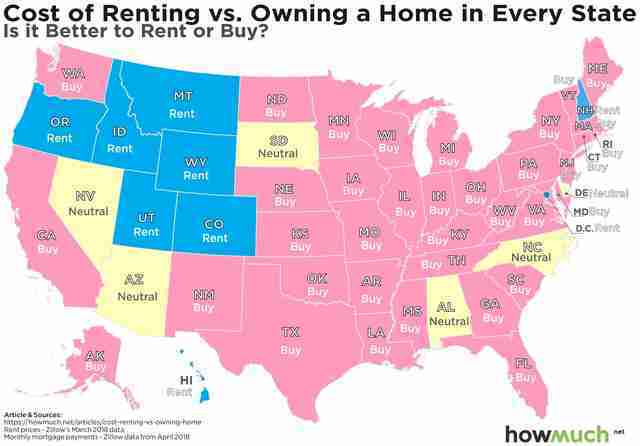 Besides assigning "buy," "sell," or "neutral" to each state, the HowMuch folks also created a bar graph to better illustrate just where it makes the least sense to rent (looking at you, New York). Then again, there are a handful of places where buying and renting are both considerably expensive options. For instance, in Hawaii, Washington, DC, California, and Massachusetts either option will set you back over $2,000 -- on average -- per month. Of course, everyone's financial situation and priorities are different, so there are plenty or reasons why you may need or want to rent in a place where it's not technically the cheapest option, and vice versa, but the map is still an interesting look at the differences in the housing markets around the country at a macro level. Though, if what you're on the hunt for is simply a super-cheap house in a wonderfully affordable city, this might be a bit more helpful.